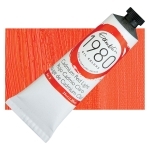 This Naphthol Red is a bright deep red with bluish undertones. It has an average drying time. This Naphthol Red has fair to good lightfastness, not because of its masstone, but because it fades in tints. Not suitable for exterior use. Naphthol Reds are not considered toxic. They may cause eye, skin, or respiratory irritation. Contact with dry pigment should be avoided. Naphthal, Naphthol Bordeaux, Naphthol Carbamide, Naphthol Carmine, Permanent Carmine, Permanent Red.